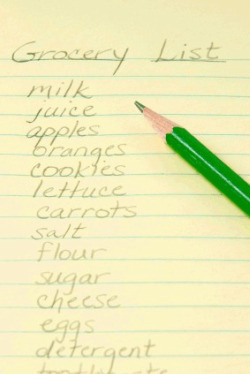 Do you struggle to make your grocery shopping list each week? I used to, because I could never remember what I needed, didn't know what we were going to eat all week, and didn't know what special events I needed to buy for. The best way to keep from forgetting something at the grocery store that you used the last of, or are running low on, and need to replenish, is to write your grocery list all week long. As soon as your daughter uses the last of the peanut butter or your son eats the next to last piece of cheese, write it down to buy more. You have so many things going on in your mind, you are not going to remember this later like you think you will. Just go ahead and make it easier on yourself and write it down now. All family members that are old enough to write should participate in filling out the grocery list all week long. If they use the last of something, or better yet, when something just gets pretty low instead of all the way out, they should get in the habit of writing it down themselves on the grocery shopping list. I suggest a special place on the refrigerator for the grocery shopping list. We have a white board on our fridge, held there with magnets, that we use. There are some things every household always puts on their grocery shopping lists, week after week. These staples need to be restocked consistently so everyone always has them available. I grew up in a house where we always had two staples on hand, one in use and one in reserve. When the one in use got used up we opened the reserve for use, and then bought another one, to become the reserve. How this works in practice is, say for example, you use the last of the shampoo, and have to get out the next bottle, make sure you write down on your running grocery list, "shampoo." Otherwise, when you use all of the reserve bottle of shampoo, and run to get the next bottle, while dripping wet from the shower, it won't be there. I have used this rule of two for all the staples in my own home that are non-perishable, and it has really helped me make sure we do not run out of essentials like toilet paper and toiletries. Obviously, this rule works best with items that will not spoil, so use common sense. 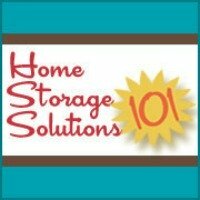 It can also be helpful to create inventories to post in certain cabinets, such as a pantry inventory, cleaning supplies inventory, or toiletries inventory so everyone can help keep you informed when they use something up and put the reserve one into use. In every household, but especially those with small children, there is almost always some special event going on each week that requires some type of item from the grocery store. You may need to bring brownies for the bake sale, you're having a potluck lunch at the office, your daughter is having a sleepover with friends, or it is your week to bring snacks for the soccer team. Whatever the event, it is much easier to plan ahead of time and pick it up with your regular grocery shopping than a mad dash the night before. This is also an area where family members need to help out and put special things on the list that they need for their own events. There needs to be some personal responsibility and consequences, in my opinion, within reason. If it my fault I forgot about my two-year-old's Valentine party at daycare, I will run to the store at 10 o'clock in the evening the night before to pick up cookies. If an older child does not mention to me the need for cookies for the bake sale until the night before, they better have caught me on an indulgent night. Otherwise, they can explain why they don't have anything, and I am not going to feel bad about it. All week you should be writing your grocery list, but then once a week you need to fill out a final grocery list. This is when you will use the most effective technique of all: a weekly menu planner. The most important way to make your grocery lists quickly and simply is to plan your meals for the week before you write your final grocery shopping list. Meal planning is such an important subject that it deserves its own article. Suffice it to say now that when you know what meals your family will be eating next week, it is quick and easy to go down the list and write down the ingredients needed for each meal. When you are ready to draft your final grocery list organize it by sorting the items by which aisle they are found in your grocery store. Being able to find everything quickly, without backtracking, even when you have a rambunctious toddler sitting in the grocery cart. Being able to skip aisles completely that you don't need anything from, which shortens the trip and cuts down on impulse buying. Rewrite your grocery list your family has created all week, along with the additional items you need based on your weekly menu plan, and just separate it out by aisle as you rewrite. Use a printable grocery list that is organized by aisle, with your staples and frequently used items listed on it, and then fill it out each week based on what you need. Planning coupons ahead of time gives me a chance to read them and make sure I purchase the correct size or quantity that must be used with the coupon, without trying to decipher the small print while my child is fidgeting in the cart. Once you have planned your coupons, make a small notation on your grocery shopping list to remind you of the criteria for the coupon without fiddling with your coupon organizer right then. I hope this has helped you see ways to quickly and easily make a grocery shopping list that will actually list the stuff you need for the week on it. That way you don't have to keep running back to the store for forgotten items, doing without something you really needed, or spending excessive amounts of time drafting the list each week.